This morning the King’s Forest Half Marathon, my first trail half. Or rather, half and a bit as it was long: the race director said 13.71 miles though I measured it a bit less. I arrived in good time at West Stow Country Park and put the car in the overflow car park, missing a huge hole which would have got the car stuck and possibly damaged it – it may be a field, but it is a field signed as a car park, and while I wasn’t expecting ‘flat’ I wasn’t expecting such a large hole, either. I picked up my registration pack which included a bold orange t-shirt, which will get more use for routine runs than array of darker colours I’m starting to collect. There was also a chunky chip-timing device which I strapped to my ankle. I returned to the car and pinned on my race number. I chose to wear my hydration backpack today, as it was a warm day and there were just two water stations. There is a lot of advice about not making sudden changes to footwear, clothing, nutrition, and so on, between training and racing. Well, the hydration backpack has rapidly become something I rely on during longer runs, and despite the minor penalty of running with an extra 1.5kg on my back, I think there’s a lot to be said for sticking with what’s familiar and what works. We assembled near the start for the pre-race briefing, given by a chap with possibly the loudest voice I’ve heard. There was good news and bad news. The bad news was that with a slight change of route to avoid knee-high nettles and brambles, he’d measured the course at 13.7 miles. (To be fair, the publicity had always made it clear that the distance was approximate.) The good news was that it was a lovely sunny day. And so we were off promptly at 10.30am, an hour behind the marathon runners. I had expected that the fastest of the marathoners would catch me up near the end of the route (as they were doing two laps of the half-marathon course) but that didn’t happen. We started along the River Lark, including alongside a lake, mostly firm footing with a small bit of mud and a couple of gates. Then we crossed the road and took to field-edge paths to Icklingham. I found that I was going too fast, but struggled to slow down, and once I’d done my first 40-second walk break found that I was between people on narrow trods, which made me want to avoid getting in the way by slowing down. After the first drinks station at Icklingham, we turned north and the start of a long gentle climb across breckland. It was lovely scenery, but still I was going too fast given the ascent. There were quite a few large puddles on the level ground at the top, and some sandy, gravely patches from time to time, but mostly the going was not too demanding. We eventually turned into the eponymous forest, with some challenging running initially, on a hogsback of a section which descended and ascended every few metres. After the second drinks station, I ended up at the back of a procession of five along a narrow trod, which worked quite well, but I was now starting to tire. The remainder through the forest did at least benefit from quite a lot of shade on a warm day, but it was increasingly hard work and my pace slowed. A woman who I’d caught up coming out of Icklingham, and who had then got away from me, was having problems with her knee, and we passed and re-passed each other several times, before I eventually kept ahead. At various points, the route through the King’s Forest was in familiar places, albeit often from an unfamiliar direction. We eventually emerged to cross the road for the second time. I passed the magic 21.1km and soon there was the sound of strong applause, and I realised it was for me as I powered over the finish line. 2:08 was my second slowest half (my first attempt at Reading being 2:10 but the last 4km or so of that was walked when my knee gave way), but my position of 39th of 101 was my best relative position in a half (first time in the top 50%), and I suppose a trail HM PB (and also my longest race as it was measured slightly long). A trail should be expected to be harder, and I should be satisfied, but I was a bit frustrated, in part because I had failed to pace myself well enough. Looking back, I probably did too much running in the last fortnight, too, plus a very cold swim on Thursday took more out of me than I’d realised, so all in all I wasn’t quite 100% at the start line. A great welcome at the end, and lots of cake. It was bright and sunny when I left the house, but started raining heavily once in Norfolk, and it was a gloomy scene when I reached the puddle-strewn car park on the edge of the common at Mulbarton just south of Norwich. I waited in the car for a while, and the rain turned to drizzle, then I got out and warmed up my legs a little with a jog around, then joined the growing numbers of people for a little chat. We were then all taken across the common to the start and the briefing. 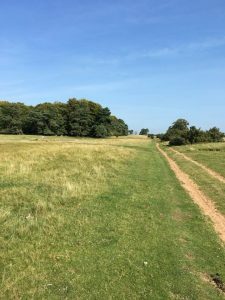 The route is 3.75 laps of the common, which is more interesting than it probably sounds, with a variety of conditions underfoot, slopes up and down, trees, a few sharp corners. The rain stopped for the run itself, which was an improvement, though of course the ground was by now rather damp. One chap I overtook on every uphill and he overtook me on every down, but as the up came last, I managed to beat him. I finished in 23:58, which I was quite content with, and was 31st out of 100 runners. 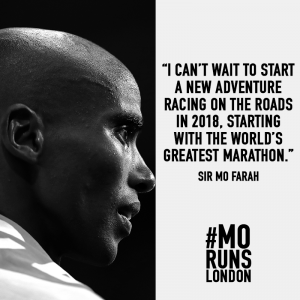 Great news that Mo Farrah has decided to join me in running the London Marathon 2018. I can talk for years to come about running with Mo. Great news. And I’m confident that such will be my speed that Mo will be nowhere in sight when I cross the line. His win today of the Great North Run for the fourth consecutive year was a mere 59 minutes faster than my time at Great Yarmouth – but the latter did involve some grass at the start, which makes all the difference. My shortest race yet was the Stowmarket Golden Mile race on Saturday afternoon, being a mile through the main shopping street. Rightly or wrongly I did a 2km warm-up with some sprints about 50 minutes beforehand, this being the first time ever that my warm-up has been longer than the race. The entry was 300 people, and it was a very busy start up a gentle hill before entering the main shopping area where there was some good support, then little footpaths before returning to roads to enter the park for the finish. The best value paid-for race I’ve done: in addition to all the organisation, there was drink, food and a medal, all for £3. Thanks to the Stowmarket Striders running club for their organisational efforts including the many members volunteering to help manage this fun event. It was rather too crowded at the start and too undulating (and warm) for a PB, but my second-best mile time so quite pleased with that. With a holiday of over a week in the USA planned, I wanted to do some running while I was there. The holiday started with a day in San Francisco, where there are some good running spots, but I was very tired from the long journey to get there, we had a packed day as it was to make the most of a fascinating city in a day, and there was no good running near our hotel, so that pleasure is indefinitely postponed. So, after 33 hours on the California Zephyr AMTRAK train we reached Denver, Colorado and the neighbouring Aurora, which gave me the opportunity for a run, albeit not very thrilling. I managed 3½ laps of two blocks around the airport hotel, which had the novelty of being my furthest west run and my highest at around 5000 feet above sea level. I didn’t notice any significant impact from the altitude. 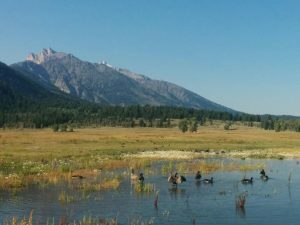 A couple of days later, after the remarkable spectacle of a total eclipse of the sun and a beautiful visit to the Rocky Mountains National Park, we reached Teton Village on the edge of the Grand Teton National Park. In among other activities, I went for a beautiful run. It was 28°C and now at 6300 feet above sea level so I took it easy, giving plenty of time to admire the glorious views to the Tetons. More of the sights of America in the Teton National Park, Yellowstone National Park, and the Craters of the Moon National Monument, before reaching Boise, Idaho. 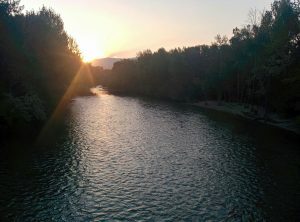 The final morning before starting the journey back to the UK gave time for 6km along the Boise Greenway either side of the Boise River, starting before dawn. It wasn’t as interesting as the map had hinted, as there was little to see of the river from the paths on either side, vegetation blocking the views, but still pleasant to be out before the heat of the day, and this became my new “furthest west” run. A few years ago, a holiday in a series of strange places, and the temptation of the hotel bed would have meant a holiday from running, but now I’m pleased to be taking advantage of the opportunities to run somewhere new, without letting it dominate the holiday. 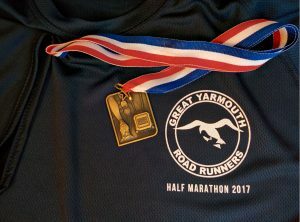 After an emotional rollercoaster of an evening at the World Athletics Championships in London last night, today it was time for my own athletic effort, the Great Yarmouth Half Marathon. It was a very well organised and incredibly friendly race thanks to the Great Yarmouth Road Runners – really friendly and helpful at race HQ, and really superb marshalling: lots of noisy encouragement (static and on bicycles and motorbikes), plenty of water to drink, plus cooling hosepipes and jelly babies if wanted. Despite the name, the race doesn’t visit the town of Great Yarmouth (presumably gaining its name from the running club rather than the town), starting and finishing in Gorleston and taking mainly rural lanes to the south and west, and incorporating the grounds of Somerleyton Hall: I’ve pinched the picture – it wasn’t mine, but I tried to take in the view as I passed, as it’s so easy even on the most picturesque runs, especially when running hard or to a fixed pace, to fail to take in one’s surroundings. 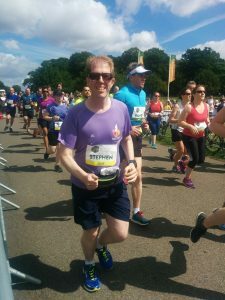 It was my first half-marathon race using a run/walk technique – every mile, I walk briskly for about 35 seconds, to give my legs just a little time to recover, also giving the opportunity to drink from plastic cups while walking, and consume any gels etc. at a walk rather than run. 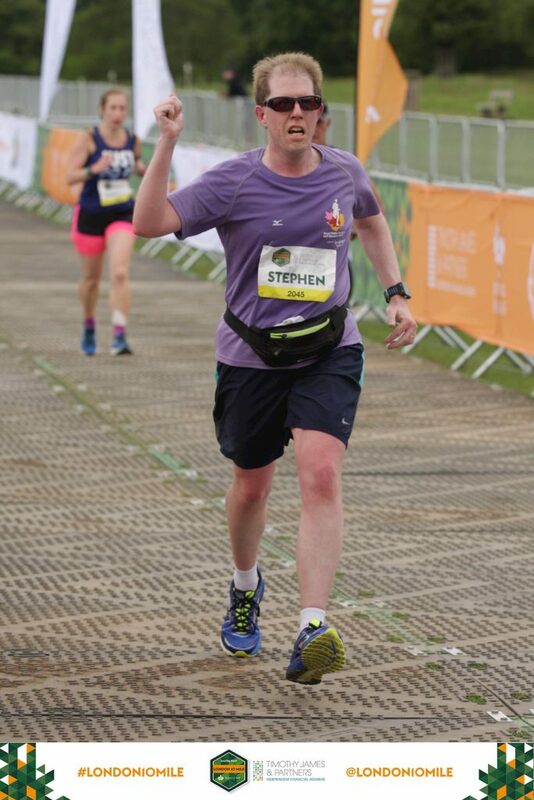 I used the approach for a 10-mile race at the Lee Valley Velopark in the spring, and set a new PB with it, then signally failed to do so at the London 10-mile when I reverted to full-time running, and I’ve become a convert to run/walk on distances longer than 10km. I had quite a while to chat (in short bursts) about the approach with one runner, Donna Crake, as we passed each other a total of 14 times. I think she was intrigued though perhaps not persuaded, but subsequent online discussion elsewhere seems to have caught the attention of another runner who is going to try it shortly in a long training run. I was aiming for 2:03 which would have been my best HM time this year, and consistent with the plan to PB at Snetterton in November, but I felt good early on, and pushed the pace a little, then felt great after half-way so pushed it further to run negative splits, and finished in 1:59:06, a new PB, despite all my previous half-marathon races being fully run rather than run/walk. The beaten PB is from the Reading Half in 2010 so there is life in the old legs yet, and it was 6 minutes better than my training run half-marathons this year. Really pleased with that. After resting for a short while and eating my post-race banana and drinking my water, I spent some time afterwards with a first-aider as I had pins and needles the length of both arms and hands, a first for me (other than when associated with migraine), but it passed in about 15 minutes with rest and gentle exercise. The first-aider was very calm and reassuring. She suggested it was most likely to be caused by keeping my arms a bit too bent while running too much of the time, and I do work them quite hard towards the end of long runs as a means of maintaining or increasing the speed when my legs start to tire. I had my protein recovery drink, another thing that I’ve become a convert to, then returned to the race HQ (a school) where the friendly volunteers returned my bag and I had a shower and changed into clean and dry clothes – a very civilised thing to be able to do after a run, and not something I’ve previously been able to do. Congratulations to the Great Yarmouth Road Runners on a superb morning. So with venues 42 onwards now immortalised in this blog, I wondered what I could remember of the earlier locations – do they all merge into one or are they still distinct. With a fairly modest tally, I found I could mentally picture them all (Northampton caused some hesitation, but it soon came back to me), though full detail of all of them is missing. 1 – Bury St Edmunds. Where it all started. I don’t remember much about this first visit but it must have been ok as my first time of 30:29 was beaten on each of my next six visits over the following two months, falling to 27:27. Two laps of Nowton Park have since become quite familiar, though with one day run backwards, and some tweaking of the course for the winter. As elsewhere, numbers have grown quite a bit, adding to the mud challenge in the wetter months, and initially sparking my parkrun tourism though I’m now less frightened of mud than I was. 2 – Fell Foot. Three months after my parkrun introduction, a holiday in the Lake District meant that the parkrunning could continue. In principle a gorgeous view up Windermere but in practice my eyes were more focussed on the ground to make sure of my footing on the slippery grass and muddy sections. Some short but sharp little ascents. 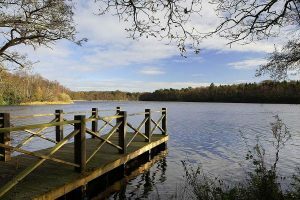 3 – Thetford. Second-closest to home, and so a natural progression. A rather different atmosphere to Bury St Edmunds and clearly a different population mix, with many more slower runners and a lot more people who know each other. Potentially a confusing course to describe or understand as a concept, but not really difficult in practice to run. A lot of lumpy grass. 4 – Keswick. Another Lake District holiday gave me the opportunity for more exploration, particularly as the Keswick railway path had long been on my list of places to explore but which I’d never quite got around to. A gorgeous out-and-back route crossing the river several times, with a very slippery first (and therefore last) bridge, and a slightly tricky boardwalk descent/ascent where the original railway route had been destroyed by the Keswick bypass. Glorious views up to the slopes of Skiddaw. Definitely among the most scenic of the first 45. 5 – Harwich. A meet-up at the bandstand, then a little bit of grass at the start and then mostly along the prom and back. On my second visit, the course had been adjusted and there was much less grass and more prom. 6 – Barrow. A lot of up and down in a very undulating town park, all on hard surfaces. My slowest parkrun of the first 45, partly due to the hills but mostly due to the hard work of fellwalking the previous day. 7- Gorleston Cliffs. A net downhill parkrun as it starts at the top of the cliffs and finishes at the bottom, with two downhill sections and one steep uphill, in between being straight runs along the top or bottom of the cliffs on hard surfaces with great sea views. 8 – Peterborough. A very busy start but once it thinned out after the first kilometre or so, a delightful run around the lakes next to the Nene. 9 – Bedford. A town centre park, almost level. A busy start but nice and easy on tarmac with gentle corners for a good time. A new parkrun PB of 27:08. 10 – Workington. Out and back mostly along an old railway line. The weather was foul with strong winds and heavy rain, but having pushed hard for the first half uphill and into the wind, the downhill with the wind behind me was very quick and I knocked a minute off last month’s parkrun PB, achieving 26:07. 11 – King’s Lynn. A pleasant course in a town centre park, including a 180° turn on each lap. 12 – Penrhyn. My first parkrun to start inside a castle, and my first outside England. Somewhat tricky hills and some mud, but a great course looping around the castle with views to Snowdonia. 13 – Norwich. Heavy rain caused me to seek out a tarmac parkrun, but the tarmac paths turned out to be underwater for significant sections. Rather busy and looping around a rectangular course not the most exciting. 14 – Gunpowder. A return to familiar ground as I watched this park being created when I lived in north London. 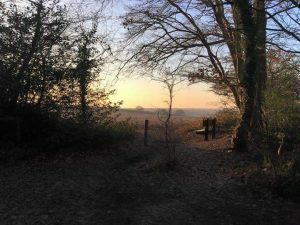 A very pleasant loop around the still maturing country park, and the unique (so far) opportunity to start a parkrun in one hemisphere and finish in the other. 16 – Swindon. Returning from holiday near Bath, a stop outside Swindon for this loop around a country park. 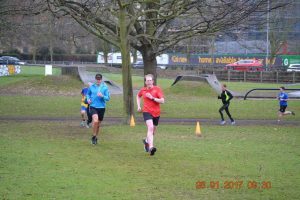 My first parkrun with pacers, who were well organised. 17 – Lowestoft. A very warm welcome for visitors. 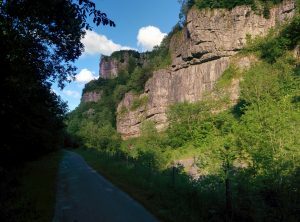 It was a glorious morning for a run along the lower and upper promenades, albeit with a stiff breeze in the face on the return legs and two short but sharp climbs from the lower to upper prom. The start was wonderfully broad so there was no problem with people getting in each other’s way. The first ascent was a bit busy with people walking; the second was quieter and I attempted to power up it with arms pumping madly, somehow managing to make that my fastest km. New parkrun PB of 25:45: my fastest 5k for 7.5 years and my 3rd fastest ever. I was so enthused that I ran another km back to the car. I got changed and then had a lovely walk along the coast to Great Yarmouth. Thus completing the Suffolk coast from Manningtree. A great day on foot. 18 – Colchester Castle. Lovely with varied scenery including the castle, the park and the river, and good support from the marshals and other runners. It was only the second parkrun I’d experienced with pacemakers: those at Swindon worked well, but it was somewhat chaotic here. The pacemakers were jumbled at the start rather than in sequence, so I was briefly ahead of 23 but behind 32 minutes, and half-way round the first lap, I was overtaken by the 25-minute person, frantically trying to catch the 26-minute person; I followed the latter most of the way round (gaining going downhill but losing ground going up) but still finished inside 26 minutes. It is rather hilly and twisty for a fast time, especially with damp surfaces, so I was pleased with that. 19 – Milton Keynes. After the pre-run briefing for newbies and visitors (rarely important for visitors, but you never know), the throng were asked to move backwards to get behind the start line, the side effect of which was to put me at the front of the 424 runners (albeit with a fairly broad front), a novel position for me. It’s a very pleasant route, and gains from its single-lap course (many town-centre parkruns being constrained by the size of the available park). There’s a good section along the Grand Union Canal, where after 1km I was caught by the 25-minute pacemaker. We then went over a road where cars honked to cheer us on, up some steepish zigzags where I overtook the pacemaker and quickly down the other side of the hill to the lake. Although the pacemaker eased past me again, the thought had germinated in my mind, and was growing roots, that if I could only hang onto her for a bit longer, this was going to be a really good time for me. So, around the lake, over two weirs and a bridge to the next lake, and although I was working hard, the pacemaker was pulling away. I started to think that 25 minutes was going to be out of reach but a good time wasn’t. I gradually caught up another runner but as I pulled alongside her, she sped up; the third time I managed to catch her and get next to her, I said that I was now relying on her, and she responded that she was relying on me. I eventually pulled ahead but she overtook on the final straight with a kick in her legs that just wasn’t in mine but I pushed hard, now cheered on by the pacemaker from the finish line. Time: 24:59, a new parkrun PB by 24 seconds. What a fabulous morning. After fresh thanks were given to my three heroines (including the race director) there was opportunity to cheer on lots more runners as I walked back to the car. 20 – Penrith. A lovely outing at Penrith parkrun with the sun shining on Cross Fell and other Pennine summits. I took it relatively easy after yesterday’s fell-walking, but my legs were happy, so my attempt at “relatively easy” was a 5:10/km pace which would have seemed unattainable only a few months ago. 21 – Brandon. My first trail parkrun. On a cold morning where I wore gloves for the first time this year it was through the woods with a multitude of tree-roots hiding under leaves, dodging many impressively large wildlife-created holes in the middle of the tracks, and coping with a fair bit of sand underfoot. An interesting and beautiful change, though twisting my ankle in the third km on a tree root was painful though clearly not serious: I ran slowly for a while and decided I could keep going, but perhaps that wasn’t wise as it was much more painful later in the day. There were cakes galore at the end to celebrate several people’s 50th parkruns, but my discipline held and I turned them down. 22 – Clacton Seafront. Three laps each starting with a long gentle incline along the upper prom, and a steep descent onto the lower prom – so many people seem to descend slowly but surely that’s the easy bit (on dry, ice-free tarmac)? Anyway, a chilly but lovely outing with the sun rising over the aquatic wind turbines, and another 32 seconds knocked off my 5k PB. Woo hoo! 23 – Cambridge. A visit to Cambridge parkrun this morning. Although I’d run most of the route on previous visits to the country park (before I’d even heard of parkrun), it was my first visit for the parkrun. Well organised and with one of the most enthusiastic and vocal crowds I’ve experienced at parkrun. Despite the start being divided up into finish times, there were a lot of people in front of me who wanted to go a good deal slower (including walk) which was a little frustrating on the narrow paths. Still, very enjoyable through the autumnal woods and around the lakes, on another warm (12 degrees) morning. The slowish start, coming down with a cold, the twisty route, and it being my tenth consecutive day of running might have taken the edge off, but it was still satisfyingly brisk, being my second-fastest parkrun (albeit measured rather short), so very satisfied with that. 24 – Great Notley. On a very foggy morning this was very pleasant and friendly – underfoot a mixture of gravel paths, grass, mud, and sand. Probably attractive to look around the country park, but not much to be seen in the fog today. And a sudden hill half-way through, which I’d been warned about but still was a bit of a shock emerging from the fog, with a large bird sculpture on top – part of the parkrun route being to tap the sculpture. 25 – Ipswich. A twisty and varied run around the park. 26 – Kesgrave. A fairly linear course on mostly grass with a bit of sand and some woodland trail. My first Christmas Day parkrun so a good few people in fancy dress but mostly regular locals with very few visitors. 27 – Millom. Described in the briefing as “not terribly quick” (the average time is 35 minutes) and today as “a bit sticky underfoot” (people lost shoes in the mud). I managed 8th, my best result by a long way – ok, the field was only 43, but still my first time in the top quintile. 28 – Carlisle. The first of two runs today on my first New Years Day double. They were on their alternative course, five laps around Chances Park: I always have a soft spot for anywhere with a ha-ha. Two young women overtook me on each of the five downhills, and I overtook them on each of the five uphills, which made for a very social run. Having come 19% of the way through the field yesterday, today I was 54% of the way through, which goes to show how such figures are need a heart-attack-inducing dollop of salt in their interpretation: today was one of my top-20 5km runs in terms of pace, too. Then a jump in the car and brisk drive to Keswick for the second parkrun of the day. 29 – Great Cornard. With the ground frozen, it was a good day for a run on the playing fields – a surprisingly interesting route they’ve managed to create for what is fundamentally a run around the football pitches. A large number of marshals, all cheerfully calling out Good Morning as I passed, which was lovely. I was still coughing away without any improvement, but it was my fifth best 5k pace, so it’s not affecting the running too much, though I did have a good few minutes of coughing afterwards. 30 – Hockley Woods. Met with friend Claire who’s recently taken to parkrunning and has decided to do all 16 Essex parkruns. A cool (minus two) morning under blue skies made for a glorious run through the undulating woods on firm ground. The organisers have put a vicious little hill in at the end of the first lap, which I hoped wouldn’t also be in the second lap but it was. Got my breath back then went back to run in with Claire. 31 – Chelmsford Central. 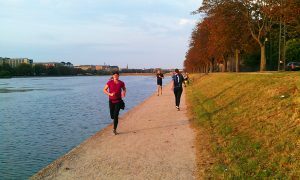 A busy parkrun around the twins parks of the centre near the river, on a mixture of tarmac and grass. More marshals/volunteers than I’ve seen before at a parkrun: 43 yellow-bibbed cheerers-on, plus others made for a great atmosphere. I was planning to take it a little easy after a really tiring week travelling, but somehow managed a parkrun PB of 23:55 by two seconds. Had a few minutes cheering in some other runners, then went back to run the last few hundred metres with my fellow parkrun tourist Claire, who knocked 26 seconds off her PB – great stuff. 32 – Catton. Catton Park was landscape gardener Humphry Repton’s first commission, begun around 1788. It was ploughed up in World War II, and then after the war much of the country park built on. The remainder opened as a public park in 2007. The run is gently undulating on a full circuit of the park on grass/mud and gravel, part of it through woodland, then a figure-of-eight including the hard central path twice. A very busy start but after that plenty of space. Another 17 seconds off my parkrun PB, down to 23:38. 33 – Wimpole Estate. Naively I had thought that with the temperature at zero all night, the ground might be firm, but it was definitely not. Wimpole Hall is near, and I set off with the car white from snow, and gentle snow falling most of the way there but barely settling. 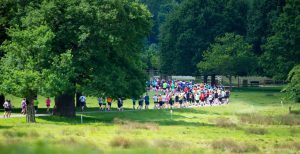 They were on their winter course to let the regular course recover: apparently it’s the busiest National Trust parkrun outside of London. Much of the run is on stony paths among the trees but the stones making up those paths are polished and slippery; a fair bit was grass and a bit was on some very impressive mud – I came away with my t-shirt muddy, never mind shorts and shoes. A great change of scene, and once again the wonder of parkrun got me out of the door when it would have been easier to conclude it was rather chilly and wet for a run. 34 – Lancaster. Two circuits of Williamson Park, home to the impressive Ashton Memorial – a really beautiful park, though perhaps less so today in the very heavy rain. The route is about 10% level, most of which was under water (over the top of my shoes in places), and the rest is hill. Strava has it peaking at 31% gradient, which may be overstating it, but it was certainly steep. 35 – Linford Wood. At the pre-start gathering, locals and marshals were very keen to keep us off the paths so as not to obstruct other users, which is fair enough though the commitment to the process suggested some local friction. 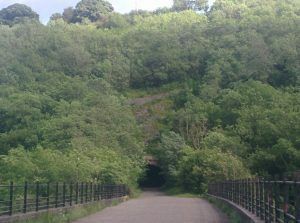 A very pleasant route, starting off through the eponymous wood, then joining the MK redway network including four underpasses before returning to the wood, the remainder being constantly twisting and turning but with tarmac or a hard resin-bonded surface underfoot throughout the run, all gently undulating. Weather overcast but very bright so it was lovely in the airy woods. 36 – Huntingdon. An extremely welcoming bunch, and an enjoyable run around the country park. Having read of mud the previous week, I wore trail shoes, but I might have done better with road shoes, but no matter. The leg strain (my Valentine’s Day injury) is still there, but after four days of rest I felt for the first time that it is improving. 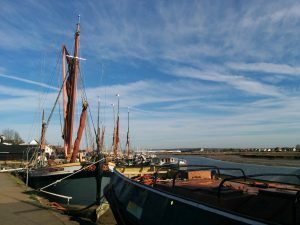 37 – Maldon Prom. Another with Claire, and this time Bruno too. I like to think I helped inspire Claire to take up parkrunning, and she in turn has inspired another friend. A glorious sunny morning with a stiff breeze blowing in across the Blackwater estuary bringing the evocative smells of the sea. A really lovely course with loops around the ornamental lake, the park, and out along the prom onto the breakwater and turning round at the statue of Byrhtnoth (Ealdorman of Essex who died in 991 at the Battle of Maldon, his name meaning bright courage), all with great views across the estuary and of the boats including several Thames barges. A busy start (it was a record attendance), but the boost that comes from the thrill of overtaking people at the start helped keep my energy levels up (or maybe it was last night’s pizza) and I knocked another 15 seconds off my 5k PB, so really pleased with that. Got my breath then jogged back to cheer on Bruno as I passed him and run back in with Claire. Calories worked off apparently 495, calories expended on gorgeous hot chocolate and superb Victoria sponge afterwards, about 495. A fab morning. 38 – Rickmansworth. Travelling to lunch with my parents-in-law gave me the opportunity to visit relative newcomer Rickmansworth for their 5th event. 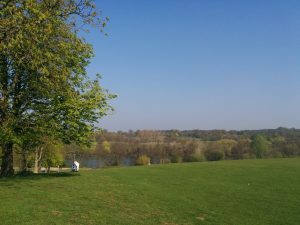 Normally it’s two laps around Bury Lake and Batchworth Lake, but with some work going in the park, today it was three and a bit laps around the pleasant Bury Lake. I set off too fast – Strava says my first km was my 2nd best yet (and the best doesn’t really count as it was slightly downhill and wind-assisted) – and thus I struggled in the second half, though still achieved a decent time after being unwittingly dragged around the third lap by a woman who overtook me but I wouldn’t let get away – she was delighted to be thanked afterwards. 39 – Brentwood. Weald Country Park was this morning’s home. I’d never been here, a sad omission as it turns out to be delightful, with rolling grassy hills, woods and lakes. After the usual pre-run briefing to watch out for hazards including other park users, which here also include tree roots, mole hills and rabbit warrens, as well as dogs, geese, horses and deer, we were off: as it happens I only had to give way to humans and horses. A really beautiful course, among my favourites I’ve visited so far in terms of scenery, though also among the hilliest and being a trail run needing a lot of care about where I put my feet with a lot of uneven terrain. After my finish, I jogged back to find Claire, who it turned out had taken a tumble in the woods and was a bit cut and bruised and with damaged glasses, but still as cheerful as ever as we ran the last section together. Cake and hot chocolate afterwards not quite up to the standards of Maldon, but very acceptable. 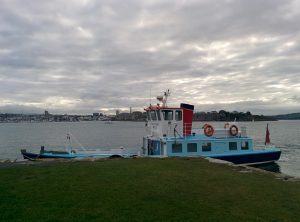 40 – Mount Edgcumbe. I’m staying in Plymouth over Easter, walking another chunk of the South West Coast Path. I had a lovely 25km walk yesterday so started today with slightly tired legs. In anticipation of this, I pledged only 2 rather than my normal 3 runs for this week, but I decided not to let that stand in the way of my increasingly traditional parkrun tourism, so in good time I walked across Plymouth in my running stuff while carrying my day’s rucksack including walking shoes and clothes, to catch the 8.15 ferry across the water to Cremyll and then the walk up the hill to Mount Edgcumbe House. With hindsight, the word “Mount” in the name of the parkrun should have been a clue. This may be the hilliest in the UK, with about 150 metres of ascent, and it’s net uphill too as the start is at the bottom of the hill but the finish is part way up. So a hard run for me, but I was pleased to be only four minutes slower than usual despite the challenging course and tired legs. A glorious run with superb views across the Sound and up the Hamoaze and lovely sections through the woods too, and the splendid House itself – plus my first parkrun accessed by ferry. Just time to catch my breath, get changed and catch the bus along the coast for another 22km of the coastal path at a slower pace. 41 – Mersea Island. One of the parkruns where a quick check of the tide times and weather forecast before planning a visit isn’t a bad idea. The marker boards for tide depth towering six feet above the causeway give pause for thought, though I’ve only seen a few inches on the road myself. Met with friends on arrival: my gaggle of people I’ve inspired to take up parkrun or who’ve then inspired others has growth to five. 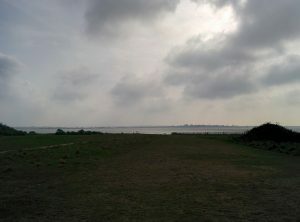 A cloudy and windy morning, but a pleasant course with views of the Colne estuary and the sea, a pleasant wooded stretch and some lovely smooth grass which was very exposed to the onshore winds blowing straight in our faces. A decent time, a little slower than some but still better than the 2009 time that until October last year I was resigned never to beating, and now seems slow. 44 – Roding Valley. New parkrun PB of 23:31. 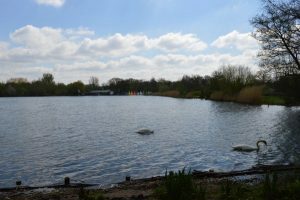 Plans to visit Clacton parkrun with Claire were put on hold for several reasons, and so I decided to head north to avoid the rain, selecting Fritton Lake parkrun, between Beccles and Great Yarmouth. Located on a private estate used among other things for outdoor activities and woodland lodges, the signage on arrival was poor, but by the expedient of following others I found myself in the right carpark. 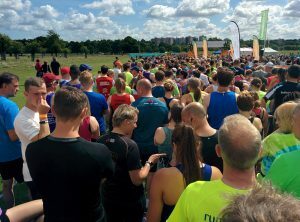 Later, at the start line, there was an announcement that the current system of parking permits was being changed to allow the display of a parkrun barcode in the car to authorise parking. There was no information that I saw at the carpark, and certainly none at all on the website, that referred either the old or the new system. I wandered from the car to the start area, and hung about waiting for the new runners briefing. Maybe I missed it, but if so it was very subtle – I suspect there wasn’t one since when we assembled at the start line, some of the core elements of a new runners briefing were there, but in the worst implementation I’ve yet seen: it didn’t greatly matter to me, but for a genuinely new runner, the “passive welcome” was lacking even if any active welcome from individual enquiries might have been great. The route was described as “broadly two different figures of eight, overlaid” which was far from helpful, but it’s not unusual for me to run a new parkrun without understanding the route in advance: usually it’s just a question of following the people in front, well supplemented by signs and marshals. 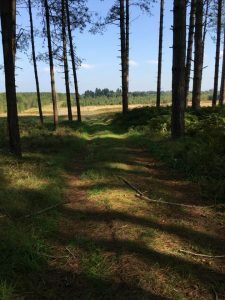 Most of the route was through woodland, at times with views of the lake, with quite a few tree roots and holes to avoid, plus a bit of bracken, bramble and nettle to skirt round in a few places, but nothing difficult in very dry conditions. However, the route-finding was far from obvious once I lost sight of the people in front of me. Bring a compass and orienteering skills! It turned out I went the right way but I had long periods of doubt, and there was luck involved. There was no-one in front of me for significant stretches with multiple possible turnings and though I checked and there were people behind, I worried they were following me blindly. When Natasha Rout who had been following and eventually overtook then called “which way?” at a fork, I had no idea! I found myself thinking of Mo Farrah’s final 10k track race on Friday night, and every time the Natasha who was on my shoulder for quite a while pushed the pace a little, I pushed back a little harder. Very motivating, until she inched past me and then I started to run out of energy a few hundred metres from the end. Unlike Mo, I lost by 15 seconds, but still a good run. Final time 24:43 and 19th out of 71 – not my best by some margin, but a moderately tiring week and a rather twisty course with roots and holes to watch out for. Hopefully I haven’t tired my legs too much for the planned 10-mile run tomorrow morning. More signage and/or marshalls needed, but a lovely spot for a run (in dry weather, anyway). 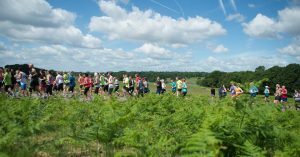 For those not in the know, parkrun tourism is the deliberate visiting of multiple parkrun locations, and has become a popular activity for growing number of parkrunners, with its own jargon. Part of my wandering was driven by an effort to visit less muddy locations in the winter than my home parkrun of Bury St Edmunds, but in 2016 I started to visit other parkruns simply for the pleasure of visiting new places and new people, running courses of different characteristics. Ironically some of them have been more muddy than Bury St Edmunds as I’ve become rather more relaxed about varied terrain. 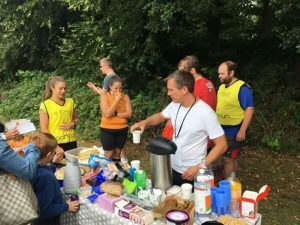 There is a most events table on the parkrun UK website, and a similar global one, so for UK parkrunners at least, someone visiting 20 different venues may be regarded as a semi-unofficially a tourist – but make up your own rules. 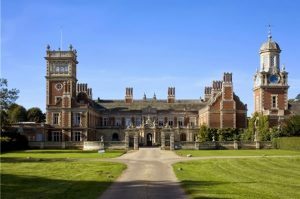 I’m aiming to visit all of those in the East of England region (55 at the time of writing) but I’m in no particular hurry to get there – it’s the journey rather than the objective that’s the fun thing. Others have been picked up usually in association with holidays or other times away from home. The map shows the parkruns I’ve so far visited. Before last year, going on holiday was generally reason not to be running, but with my commitment to run in more different locations, and to maintain fitness without the excuses of travel (leisure or business), that has changed. My runs while away from home may sometimes be shorter or easier, but hopefully most offer plenty of novelty. First up from this trip away for some sailing in the Baltic was Denmark: a 6km circuit of the Copenhagen lakes. Quite a few other runners about including a tall muscular blonde going at just the right pace who I enjoyed following, then overtook for a kilometre while she followed me, then we swapped places again. 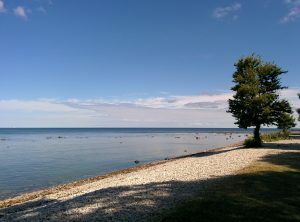 After a train journey from Copenhagen to Kalmar in Sweden, we sailed overnight to Visby on the island of Gotland. Overnight watches could have been an excuse to take things easy but instead I headed out for a 7km Swedish run past the port and then along a delightful promenade, partly under the old town walls, then past a large campsite which seemed to settle well into the landscape and not be a blot. Lots of people about including a few other runners, all slower than me. We had more sailing around Gotland, then another overnight sail, heading SE to Klaipeda in Lithuania. I was on deck from just after 1am, seeing three watches as I didn’t feel tired and was enjoying the various other tall ships visible in the dark and then more as the dawn broke. 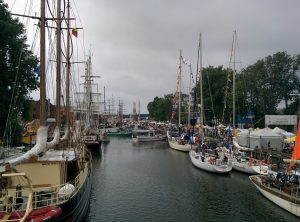 Klaipeda was to be a port in between two legs of the Tall Ships Race, which made for some great explorations on foot and by bike, and for an interesting 5km Lithuanian run relatively early on Friday morning – later we spent more time exploring some of the square-riggers, and enjoying the party atmosphere with Lithuanian music vying with Omani bagpipers from the RNOV Shabab Oman II. A visit this morning to Loughton, in Essex but for country bumpkins feeling like the NE edge of London, for the Roding Valley parkrun – my parkrun location 44. The run is around a park/recreation ground next to the eponymous river: flat and a mixture of grass and tarmac plus four bridges. Easy-going for a run and pleasant enough without any real thrills. I didn’t feel in tip-top condition (and was desperate for a pee), but I wasn’t going to let the 25-minute pacer stay in front of me for too long even if she did seem to be going rather fast. I pulled past her and though after the first km it became clear I was going “too fast” I tried to keep it up and latched onto a young girl who unwittingly pulled me along for the first 4km before she accelerated slightly while my legs really started to complain and I slowed slightly. I stopped my watch after it had recorded 5km, giving me a final time of 23:22 knocking 9 seconds off my 5km PB. Really pleased with that. 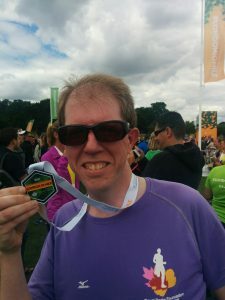 The official time was 23:31 which was also a parkrun PB – by one second. I jogged back to run the last few hundred metres with Claire, then we had cake for Roding Valley parkrun’s sixth-month anniversary: really excellent it was, too. My 43rd parkrun location was Hadleigh in Essex. I’d been here once before, in January, for the Legacy 10k on the Olympic mountain bike course, the hardest 10k I’ve done by some margin. The parkrun was easier, but still quite challenging. It starts off with a lot of downhill, initially with hairpin bends and then more than 20 more gentle zigs and zags to descend still steeply, regains a bit of height then loses more to get down to the level of the marshes. A fairly level section near the railway line is followed by an ascent on grass which I’d been warned about but which didn’t seem too demanding in the circumstances, and then a long steep ascent back up those “gentle” zig zags which seemed far from gentle on the way up, the gradient peaking at around 17%. The woman in pink in the photo chased me for much of the run, tending to be slightly faster on the flat but slightly slower on descents and some ascents, but in the end she had more in the tank for the long uphill slog. 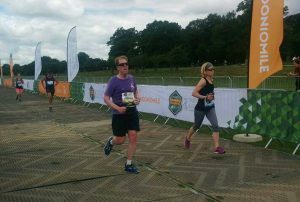 I finished in an official 26:20, not too bad in the circumstances but more than two minutes slower than Bury last week. After I’d recovered and cheered over the line a good few finishers, I jogged back down the hill to find Claire who was tail-runner today, or tail-walker as we should apparently now call the role. 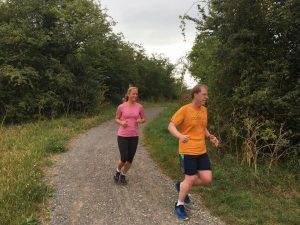 I would encourage people to come to parkrun who are combining running and walking, and wouldn’t turn away someone who wanted to walk it, but I’m less convinced that parkrun should be encouraging people who want a Saturday morning walk, but that’s a decision that has a range of passionately held views. Afterwards, Claire and I had cake in the café, joined by Roderick Hoffman, a parkrun tourist for whom this was event number 199, with Beckenham Place reserved for his 200th in three weeks. He had a lot of interesting stories to tell about his 199 events. My medium-term target remains to visit all of the East of England parkruns, though that’s a moving feast with Billericay added last week and Clare and Haverhill probably not far away. This week’s runs have seen me on the Thames towpath just south of Oxford, from home to Drinkstone and back, knocking five minutes off my Thetford parkrun PB from two years ago, and then today’s big one. I was travelling to near Manchester, so I’d always thought that if the weather was good I might spend some time walking or running in the Peak District. 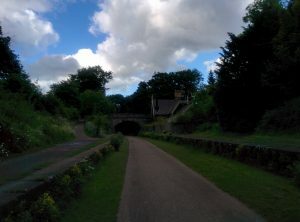 As I was late away from home, I decided that a run would be a good option, and had selected the Monsal Trail near Buxton, a former railway line now restored for use by walkers, cyclists and horse riders (I note they rarely say runners), with several tunnels and high bridges. I had planned a 10-12km run, but once out I found the idea of making it a bit longer grew on me – perhaps because most of the planned first 5km was gently downhill so it was bound to feel relatively easy. I turned round at 8km with the possibility of a 10-mile run, but on the return leg I decided to push on. 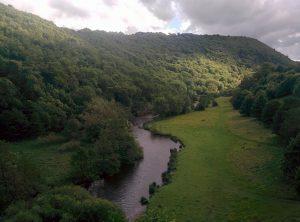 Of course, the way back was gently uphill, but although I was a little slower it wasn’t excessively hard, and so I ran on past the car at Millers Dale, ran to the western end of the Trail and turned back to the car. Total distance was about 21.7km, a smidgen over a half-marathon and my longest run yet. I was tired but not wiped out, and indeed the worst outcome was once again sore patches on my lower back/upper bottom from my sweaty shorts. As I didn’t wear my running belt (having the hydration vest on) I can eliminate that as a potential cause. It is the shorts. More testing is needed to determine whether it is this particular design (I have two identical pairs which I use for almost all my running at the moment) or something generic to me. But the ability to just choose to run a half-marathon distance almost at will is very encouraging. Running twice as far still seems an awfully long way, but there’s time to build up to that, and I needn’t run quite as fast. The scenery of the run was delightful with steep gorges and flowery meadows, the railway line cut into shelves on the side of the hill, striding across the river on high bridges, and many tunnels – I was impressed with how well the Garmin coped with those, presumably reverting to its “run indoor” mode relying on my arm swings until it could get a GPS fix again when I emerged. 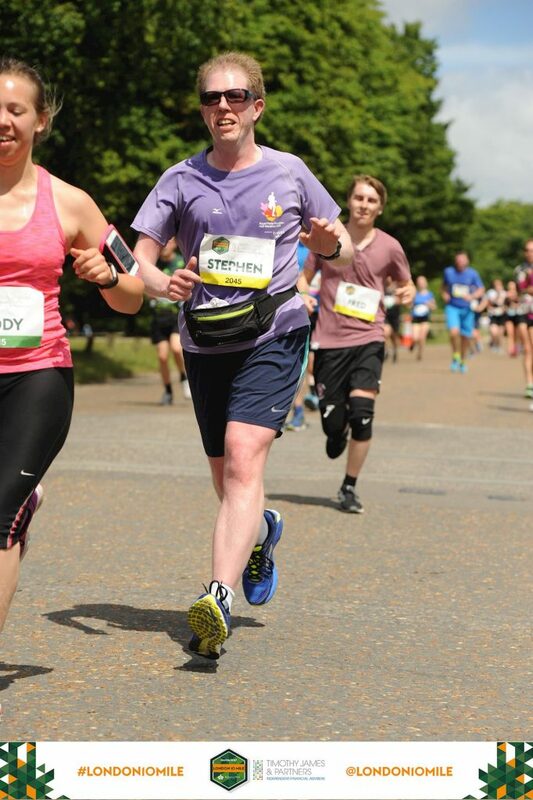 The chunky entry fee for Sunday’s London 10 Mile run included “free” photographs. Most of my 18 are actually of other people entirely or I’m barely visible. The official results put me in 1086th place (based on chip time), about 34% of the way through the field, my best relative position in a long race, helping me put things in a bit more perspective. By a curious coincidence, I was 1086th across the start line too, which all sounds very even and satisfactory, but my two halves were uneven, the first being 43:30 and the second being 45:20, and it’s those lost 110 seconds that are annoying me. I was 972th at 5 miles, so I overtook a net 114 people in the first half and was overtaken by a net 114 people in the second half. That latter was particularly dispiriting. My mysterious benefactor who had unwittingly spurred me on at several points is now identified as Harriet Kiddy, and I’ve been able to thank her via Strava. 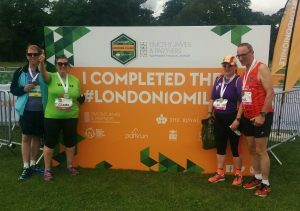 She in turn thanked me – she’d been chasing me for a few miles: great to hear that I’d been a little help to her too, and it added a further little cheer to the post-event analysis. Looking further ahead, one analysis of the London Marathon course has ascent of 54 metres, about a third of the London 10-Mile, and almost all of it very minor rises: no hills! Today was the day that running training for the last 17 weeks has, at least nominally, been heading towards. Although I would have been going out running anyway, I’ve been working to an Mbition training plan with today’s London 10 Mile in Richmond Park (originally advertised as the Royal Parks 10) as the objective. I successfully ran all 51 of my training runs (plus a small handful of sneaky extras) so had put in the work. It was a longish walk from the south where we’d parked the car near the Robin Hood Gate, across the park to the event village, but a lovely one on a sunny day, with no traffic other than cyclists and a few deer. While Lucy went to investigate whether there was scope to buy an event t-shirt, I queued for the toilets, which gave me opportunity to pin on my race number and sort out my bag and other bits and pieces. The long queue moved swiftly, and after that was sorted I dropped off my bag. There was no news from our friend Claire whose suggestion this race had been, and who has also been training for it, and so I guided Lucy to my suggested spot for her to watch the start which also allowed for an easy short walk to the 3-mile point, and then I went to my yellow pen, the second of the four pens. It was already getting busy and the 90-minute pacemaker was some distance in front of me, unreachable in the dense mass of people, and I wasn’t much in front of the 100-minute person. I wasn’t looking for a formal pacemaker but it did suggest there would be a fair few people in front of me looking to go more slowly than my 85 to 87-minute target. The start was delayed by 15 minutes for reasons not explained, but that period did allow for a minute’s silence in memory of those killed last night, and an emphatic round of applause for the emergency services. Eventually the first pen was underway, and after a short pause, our pen was too, getting me across the line about four minutes after the gun. It was very busy and slower than desired along the first straight, but once I’d turned the first corner and been cheered on by Lucy, it wasn’t too challenging to start to overtake people, both up the first hill and down the other side. I expected there to be some people a bit slower, but there were some very slow people who really should have been much further back in the fourth pen if that’s all they could manage at the start. 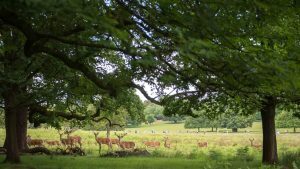 The scenery of Richmond Park is sublime and there was plenty of opportunity to enjoy it as the route wended its way to the south-east corner by Robin Hood Gate and then began its circuit of the park. I found myself running alongside a woman in pink in the second mile, and we more or less matched each other until about 7.5 miles which I think was helpful though with hindsight perhaps caused me to push a fraction too hard, though that was mostly driven by me aiming for a specific time and thus a particular pace on my Garmin. 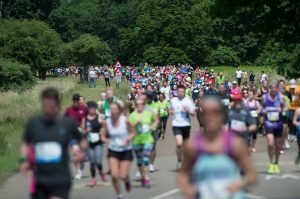 After turning the north-east corner at Roehampton Gate, there began a slow drag of 2.7km gaining 66 metres of height and all into a stiff breeze and increasingly warm temperatures. I waved to Lucy as I passed her, she calling to me from the right-hand-side when I was expecting her on the left. This section was challenging and maybe I pushed too hard here, though once we turned the north-west corner by the Star and Garter Home, the next side was downhill or level so did give time for the legs to recover somewhat, and I did one km in 5:00 and my average speed thus far was bang on target at 5:21/km. However, turning the south-west corner at Kingston Gate then produced another significant little hill, just 30 metres but at a gradient of up to 10%. The painful ascent was enlivened by tree surgeons sitting in a tree overhanging the road and cheering us on. Great fun but it didn’t have much impact on my legs which had had enough by the time I got to the top, and never regained their freshness. My intermittent companion in pink now pulled away from me, though initially not far. The ascent was followed by a steep descent which improved the speed but didn’t do much to help the legs – long and gradual would have been more helpful. 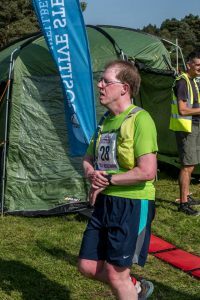 After a brief circuit at Robin Hood Gate to add a few metres to the route, it was back towards the event village along the outward route, which meant a gentle but persistent 1.7km uphill with another 30 metres of ascent in warm sunshine. I was determined I wasn’t going to walk, but the pace dropped dramatically to around 6:18/km, the lady in pink disappeared into the distance, and I was feeling demoralised as I was passed by dozens and dozens of people whose legs were in better shape than mine. Eventually I crested the hill and the remaining 900 metres were downhill and then level: although easier, my legs were struggling and I could still only manage 5:39 for the 16th kilometre. As I approached the final turn into the finish straight, after a run with relatively little support, the crowds suddenly appeared and the air was thick with “Come on Stephen” (names being printed on the race numbers), which was great to hear, and plenty of hands out for high-fives, but it wasn’t really needed by now as it’s always easy to find a last smidgen of energy for the end with the finish line in sight. I passed Lucy close to the finish, and crossed the line in a chip time of 1:28:49, some 98 seconds slower than my PB which had been my primary target and 2.5 to 3 minutes slower than my dream target. I had given it my all, and as I walked to the table with goodie bags, it was something of a drunkard’s walk, only just managing to propel myself in the right direction without falling over, and having claimed my water, protein drink, fridge magnet and packet of crisps, I had my cherished medal hung around my neck, walked out of the finish zone, and collapsed on the grass. After a short while I recovered enough to have a drink and message Lucy as to where I was. Gradually I recovered strength and after eating my crisps, drinking the water and the protein shake, I went to collect my bag while Lucy queued for some food. The food queue was lengthy, and though the food was excellent we barely had time to eat it before we went over to the finish straight to wait for Claire who’d had time to post a Facebook message that she was at Mile 9, which we noticed six minutes later. She was a few minutes yet, and we cheered a few others across the line before she appeared, jogging cheerfully, in company with Paul Wright. As her longest run before today was 11.7km, she did very well to finish, though clearly had a few breaks as she had managed to take a lot of photos on her phone including ones at every mile. So, it is done. I knew it was going to be hilly (by my standards, at any rate – there are plenty of hillier races) but the combination of the hills, the wind in the face on the leg heading west, and the warm temperatures, made the time target prove to be too challenging and in the last quarter I paid for having managed that target pace in the first three-quarters. However, I wasn’t that far off the objective, but nevertheless feel a little disappointed and dispirited. With an objective in 10.5 months which is 2.6 times as far, it also isn’t very motivating about my capacity to run such a long distance, either. Clearly I need more practice on hills, and I need more long runs both to get my legs more used to distance and to start to reclaim some confidence. Would the two half-marathons I had my eye on in August and September help or hinder that, I wonder?